This is the real approved chronological viewing order of the B5 canon, from the In House reference The Babylon 5 Historical Database, researched and compiled by Terry Jones with the full input, cooperation and authorisation of J.Michael Straczynski. "Because episodes were often aired out of order, you have to look at what's *inside* the episode when determining the chronology rather than when PTEN decided to air an episode. Midnight on the Firing Line. February 2258. Soul Hunter. Wednesday 2nd March – Thursday 3rd March 2258. Infection. Tuesday March 8th- Wednesday March 9th 2258. Born to the Purple. Tuesday March 22nd – Friday March 25th 2258. The Parliament of Dreams. Wednesday March 30th – Sunday April 3rd 2258. The War Prayer. Sunday April 3rd – Thursday April 7th 2258. And the Sky Full of Stars. Monday April 11th – Wednesday April 13th 2258. Mind War. Sunday April 24th – Tuesday April 26th 2258. By Any Means Necessary. May 2258. A Voice In the Wilderness Pts1 & 2. June 2258. See note below. Legacies. July 2258. See note below. NOTE: Babylon Squared, Legacies and Grail are placed before Signs and Portents and ordered on the basis of Delenn receiving the Triluminary and beginning construction on the Chrysalis device (shown at different stages of construction throughout). Signs and Portents. Wednesday August 3rd – Friday August 5th 2258. The Quality of Mercy. September 2258. Chrysalis. Friday December 30th 2258 – Sunday January 1st 2259. Points of Departure. Sunday January 8th 2259. Revelations. Thursday January 12th - Thursday January 19th 2259. The Geometry of Shadows. Wednesday January 25th - Sunday February 5th 2259. A Distant Star. Monday January 30th -Thursday February 2nd 2259. A Spider in the Web. March 2259. A Race Through Dark Places. Tuesday March 14th – Friday March 17th 2259. The Long Dark. June 2259. All Alone in the Night. July 2259. Acts of Sacrifice. July 2259. There All the Honour Lies. August 2259. 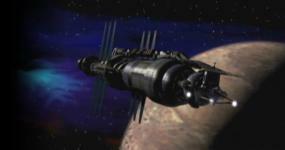 And Now for a Word “36 Hours aboard Babylon 5” Saturday September 16th 2259. In the Shadow of Z’ha’dum. Sunday September 24th 2259. Confessions and Lamentations. November 2259. The Long Twilight Struggle. Sunday December 3rd – Sunday December 10th 2259. Comes the Inquisitor. Tuesday December 19th – Wednesday December 20th 2259. Matters of Honor. Wednesday December 27th 2259 - Tuesday January 9th 2260. Convictions. Saturday January 13th - Sunday January 14th 2260. Passing Through Gethsemane. Thursday January 18th – Sunday February 4th 2260. Exogenesis. Sunday March 10th – Wednesday March 13th 2260. Messages from Earth. Monday March 18th – Monday April 8th 2260. Z’ha’dum. Thursday December 19th – Wednesday December 25th 2260 (Z minus 2 days to Z day, Sunday December 21st when Sheridan leaves for Z’ha’dum, A four day jump from B5). The Hour of the Wolf. Saturday December 28th 2260 - Monday January 6th 2261. Falling Toward Apotheosis. Sunday January 19th - Monday January 20th 2261. The Long Night. Wednesday January 22nd - Friday January 24th 2261. Into the Fire. Thursday January 23rd - Thursday January 30th 2261. Epiphanies. Saturday February 1st - Saturday February 15th 2261. The Illusion of Truth. Thursday April 3rd - Saturday April 12th 2261. Atonement. Saturday April 26th - Monday May 5th 2261. Racing Mars. Sunday May 11th - Tuesday May 13th 2261. Lines of Communication. Tuesday May 13th - Friday May 16th 2261. Conflicts of Interest. Saturday May 17th - Monday May 19th 2261. Rumors, Bargains And Lies. Monday May 19th - Wednesday May 21st 2261. Exercise of Vital Powers. Saturday September 6th - Monday September 8th 2261. The Face of the Enemy. Friday October 17th - Wednesday October 22nd 2261. Intersections In Real Time. Thursday October 23rd - Monday October 27th 2261. Between the Darkness and the Light. Monday October 27th - Friday October 31st 2261. Rising Star. Monday November 3rd - Wednesday December 31st 2261. No Compromises. Tuesday January 13th - Saturday January 17th 2262. The Very Long Night of Londo Mollari. Tuesday January 20th - Wednesday January 21st 2262. The Paragon of Animals. Friday January 30th - Saturday January 31st 2262. A View from the Gallery. Thursday February 12th - Friday February 13th 2262. The Day of the Dead. February 2262. Learning Curve. Sunday May 17th - Friday May 22nd 2262. Strange Relations. Saturday May 23rd - Sunday May 24th 2262. Secrets of the Soul. Monday May 25th - Thursday May 28th 2262. In the Kingdom of the Blind. Wednesday May 27th - Sunday May 31st 2262. A Tragedy of Telepaths. Tuesday June 16th - Thursday June 18th 2262. The Ragged Edge. Saturday June 20th - Tuesday June 23rd 2262. The Corps is Mother, The Corps is Father. Wednesday June 24th - Monday June 29th 2262. Meditations on the Abyss. Monday July 13th - Wednesday July 15th 2262. And All My Dreams, Torn Asunder. Friday July 31st - Thursday August 6th 2262. Movement of Fire and Shadow. Sunday August 9th - Friday August 14th 2262. The Fall of Centauri Prime. Friday August 14th - Tuesday August 18th 2262. Objects in Motion. Tuesday September 1st - Saturday September 5th 2262. Sleeping In Light. Wednesday December 28th 2280 - Friday January 20th 2281. River of Souls Tuesday June 8th - Sunday June 13th 2263. Legend of the Rangers: To Live and Die in Starlight. March 2265. A Call to Arms Tuesday December 17th - Monday December 30th 2266. In the Beginning (The top and tail sections with Londo are Wednesday December 24th 2278, 2245-2248 for the Earth-Minbari War, 2249 for the destruction of the Babylon Station). War Zone 1st Jan - 5th Jan 2267. The Long Road. 27th Feb - 2nd March 2267. The Memory of War. 30th March - 1st April 2267. Needs of Earth. April 2267. Each Night I Dream of Home. May 2267. The Path of Sorrows. June 2267. Ruling from the Tomb. 15th June - 16th June 2267. Patterns of the Soul. June 2267. The Passing of the Techno-mages:Casting Shadows. 27th November 2258 – January 3rd 2259. The Passing of the Techno-mages: Summoning Light. 22nd January – 15th February 2259. The Passing of the Techno-mages: Invoking Darkness 4th August 2260 – 31st January 2261. The Legions of Fire stories are replete with dates, however they are about a year out to what is established on screen. The dates presented here have been corrected and match with the established calendar. There is also another error in that Minbari cycles are said to be less than Earth years, they aren’t. A Minbari cycle is the equivalent of 16 Earth months. Legions of Fire:The Long Night of Centauri Prime. 15th August 2262 – 16th December 2266. Legions of Fire: Armies of Light and Dark. 21st December 2266 – 2272. Last edited by b5historyman; May 8th 17 at 12:07. This is the result of a lot of research and the Historical Database was a labour of love for me the fact that I was working with Joe and reference editor Fiona Avery on it was a bonus! Last edited by b5historyman; May 10th 17 at 10:23. I plan to my friend. I plan to. Speaking of chronology I love how your lists reminds us that In The Beginning is meant to be viewed late. Yes the vast majority of the material is a prequel, but it is a story being told by someone late in the overall arc. So despite the fact the majority of the material takes place before The Gathering, important plot points happen in the present of that story in 2278. If you watch it anywhere else it spoils the "surprise" about Sinclair, unless of course you've watched the series as a whole first. So how would you suggest watching this? At what point in Fall of Night would you break to watch Comes The Inquisitor? From a story viewing point of view, I wouldn't break off. One of the things that people seem to miss is there is a lot of "layering" in the stories of the B5 universe. The best example to illustrate this is, I wouldn't advocate people breaking off part way through Moments of Transition to watch Thridspace. Rather that when watching Moments of Transition that they bear in mind that Thirdspace takes place during that story. And when they are watching Thirdspace that they bear in mind that the events of Moments of Transition take place around this story. Awesome work. Specifically for Season One, is there any chance of "sharing your working" a little? Reason I ask, some things in the broadcast and "master list" episode orders for Season One bug me slightly (Delenn's triluminary-building really sticks out for me) so a few years back I tried to come up with a re-watch order which would suit me better. I blew the dust off my notes and below are all the the 'clues' I collected - which were only enough to order about half the episodes - so I'd be interested to see if I missed anything! I, too, am interested in the ordering of Season 1 -- placing "Signs and Portents" so late surprises the heck out of me.